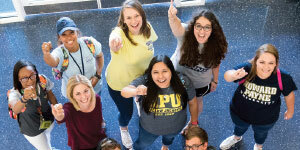 Get inspired at Howard Payne University! Howard Payne University is rich with tradition and academic excellence. HPU is celebrating its 130th anniversary in 2019 and is one of the oldest universities in Texas. Founded in 1889 for the purpose of preparing students for Christian ministry, HPU remains dedicated to providing challenging educational experiences that honor Christ and prepare students for lives of leadership and service. 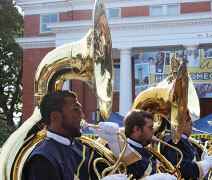 HPU offers an educational experience that integrates faith, learning, and living. The University is centrally located in Brownwood, Texas, and is within a two- to three-hour drive to Dallas/Fort Worth, Austin,and San Antonio. Think you can’t afford Howard Payne University? Think again! U.S. News & World Report ranked HPU sixth in theRegional Colleges—West division of “Best Value Schools” in its “America’s Best Colleges” 2019 edition. Howard Payne offers scholarships for academic achievement, leadership ability, community and church involvement, and field of study. HPU students from around Texas and the United States compete in six men’s and six women’s intercollegiate sports. In 2012, the Lady Jackets basketball team returned to the American Southwest Conference championship tournament after winning the title fourtimes in the five previous years. In2008, they had an undefeated season (33–0) and won an NCAA Division III national championship. If you’re looking for something a little less competitive, Howard Payne University offers a variety of popular intramural sports. A large number of students participate in intramural sports like basketball, flag football, softball, volleyball, and many more. Looking for a college that takes learning outside the classroom? With study abroad programs, HPU students have had the opportunity to learn in countries like Egypt, England, Hungary, Italy, Mexico, Spain, and Turkey. Howard Payne’s Baptist Student Ministry offers many different opportunities to minister, whether locally, overseas, or in the United States. Sit in on a class, tour the campus and facilities, and visit with professors and students. You’ll never know until you experience it for yourself. Visit Howard Payne on one of our many preview dates, or call our admission office to schedule a personal campus tour. We would love to show you around! Here you’ll find a world of possibilities for discovering what inspires you while putting that passion into action through learning, competition, service, and faith.